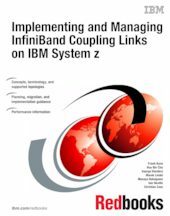 This IBM® Redbooks® publication provides introductory, planning, migration, and management information about InfiniBand coupling links on IBM System z® servers. The book will help you plan and implement the migration from earlier coupling links (ISC3 and ICB4) to InfiniBand coupling links. It provides step-by-step information about configuring InfiniBand connections. Information is also provided about the performance of InfiniBand links compared to other link types. This book is intended for systems programmers, data center planners, and systems engineers. It introduces and explains InfiniBand terminology to help you understand the InfiniBand implementation on System z servers. It also serves as a basis for configuration planning and management.